After the Disciples of Tzeentch Battletome came out it seemed almost a given that the rest of the Chaos Gods would get the same treatment. We're not to be disappointed, with Blades of Khorne following in its brother's wake in glorious fashion. So how does the second Mono-god book and second redone Battletome (following the Stormcast one) fare? 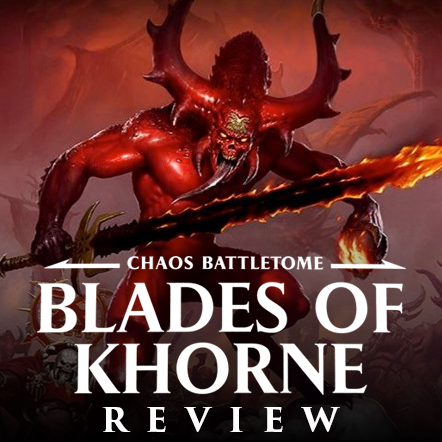 I know some people may be saying they are sick of all of the attention that Khorne has been getting since AoS came out, but being the main antagonist of the Mortal Realms it seems only fitting that they get a shot at an updated Battletome too. Instead of just being the Bloodbound this time around, we also get all of the Khorne Demons as well as allegiance abilities that can be used on mortal Slaves to Darkness units with the Mark of Khorne. First things first, I have to say I think this cover is a huge improvement off the Bloodbound cover. The art style is much more to my liking and also much more menacing. This Bloodletter really feels like someone you don't want to run into. In fact, I don't think I have ever seen a Bloodletter depicted this menacingly. Its face looks a ton like a skull, which is just perfect for Khorne, and is a little disturbing. The composition on colors are spot on for Khorne as well. I particularly dig the flaming skull its holding. Of course we also get Khul hanging around in the background. This cover is definitely up there with some of my favorite ones for AoS so far. Once you crack it open it's structured a bit like the Disciples of Tzeentch one was. We get all of the background lore for Khorne himself and his demons, followed by the Bloodbound. If you have been in the hobby for awhile there's probably not too much new in the background for the Khorne demons, but it's still a great read. For new players, you'll learn all about Khorne and how his armies are structured. We also get one page of example color schemes for the demons before we move onto the mortals. Maybe it's because I just played in a team tournament with my friend who plays Khorne Demons, but I found all of this really interesting and if I didn't already have about five other projects going on at the same time I would be tempted to start up a small army of them. The lore on the Bloodbound isn't a direct copy of what was in the previous book, but most of it will be familiar. We also get a recap of everything that has happened to them during the Realmgate Wars up through the Allgates battle. Now that the world is more fleshed out the Bloodbound seem to fit in it better for me. They're no longer just the "bad guys". Khul gets a one page call out all on his own, being the figurehead for the Bloodbound. For those who don't know, Khul is the Mighty Lord of Khorne you get in the starter set. He's the one who first fought the Stormcast, and now he is hellbent on defeating Vandus and the entire Hammerhand chamber. After the events of the Realmgate Wars he seems like even more of a threat, with the forces of the demon princes of Orb Infernia now under his control as well. I'm interested to see where his story arc goes and I'm glad they seem to be moving forward with him instead of leaving him behind. We also get some color scheme examples for the Bloodbound here, just like with the demons. There is one little bit of narrative in here which is pulled directly from the previous Bloodbound book verbatim as far as I can tell, but it's a good story and one that reinforces the Bloodbounds nature, so I can't really fault them on that. After the main section of lore we get the timeline for the Khorne forces, with much of it being familiar events again, but there are a few new ones scattered throughout. They also move the timeline all the way up through the Allgates. Next are the individual unit descriptions. Just like with the first half of the book we get the demons first. It goes into detail on everything from Bloodthirsters to Bloodletters. I found this all pretty interesting and learned a few new things myself. The Bloodbound come next and it covers all of the same units as the last edition of the book. The section on the Gorechosen is presented pretty cool, with some awesome illustrations for each of the eight heroes. They are all laid out on one page, which does mean that their descriptions are pretty short, probably about a paragraph each. I don't think there is any new information in here, but the description of the Bloodreavers made me cringe a bit. I don't know if it was that gory about the details last time or if they amped it up, but yeah, you definitely get a feel for how depraved they are. Maybe I just blocked it from my memory last time. It's great for the forces of Khorne though. If you're not cringing every now and then while reading it then their not writing it right. The illustrations in this are, for the most part, stuff we have already seen. A lot of the demon stuff is new though and wow, some awesome looking art. There's a full page one of a Bloodthirster towering over some Stormcast that is probably my favorite in the book. The art is great all around, and for players new to Khorne it will all be new! The art direction for Age of Sigmar is something I have been really enjoying since this game launched. It would be awesome if they released an art book at some point. The model pictures sections is split up just like the rest of the book, with the demons first, followed by the Bloodbound. This includes the 'Eavy Metal section, which means we actually get two of these sections. Not much I can say here. The model photography continues to impress and really makes you want to start collecting the army. Several times during this book I had to remind myself that I don't have time to start a Khorne army too. I'll just have to live vicariously though my friend who collects them. Now we get to the rules, starting off with the new Allegiance Abilities. Just like with the Disciples of Tzeentch book all you need to unlock these abilities is a pure Khorne army. This means you can have Bloodbound, mixed with Khornate Mortals, and Demons and still make use of these abilities. The Khorne Allegiance Ability is called the Blood Tithe and fits the army's theme perfectly. Basically you gain a Blood Tithe point for every unit that is killed on the table, friend or foe. As you accumulate these points you can expend them at any point during your's or your opponent's hero phase. There are eight different Blood Tithe abilities, costing from one Blood Tithe point to eight, as you would expect for Khorne since eight is his sacred number. These do things like healing your army, allowing you to charge, allowing you to pile in and attack, or instantly summoning any Khorne demon unit to the table. Remember, you can do this in your opponent's hero phase too, which means you can pile in and attack your opponent in the middle of their turn. Don't want him to use a certain hero's ability? Activate a unit near that hero and kill them in combat before they get to them in the hero phase. It's all some really cool stuff. Any points you don't use though when you activate an ability and lost. So if you had five Blood Tithe points accumulated and you want to use the ability that only costs two, then you lose the other three points and have to start gaining them again from zero. You can also only use one ability per hero phase. One cool thing you can do though if you want is take a couple of cheap Bloodreaver units and just throw them into situations where they will die so you get a Blood Tithe point out of them, since you gain them for your own units dying too. The command abilities are broken into three different tables: Bloodbound, Demon, and Mortal. Depending on what keyword your general has determines which table they can pick from. It also specifically says that your general must be a hero to pick a command ability, so I guess that's an end to unit champions taking command abilities. The first three abilities on each table are the same, while the second three are all unique. There really doesn't seem to be a bad choice here. I'm sure a few will start to stand out as the best options, but all in all I feel like GW did a good job at making them all viable. This hopefully means we will see a bit of variety in what people pick. There are also a few artifacts tables. There are three for non-demons; one for both mortals and Bloodbound, one for Bloodbound only, and a banner table with three different banners you can pick from just like with the Stormcast book. Again, these all seem pretty good. The demons have two different tables to pick from; one is mostly weapons while the other is armor and stuff like that. The last thing we get in this section are the new prayers that your priests can use. There are six new prayers they can choose from, and once again, I think GW did a good job at making them all have their uses. Amongst all of these prayers, artifacts, and command abilities, there are several ways for you to generate additional Blood Tithe points. There is one prayer where your priest can inflict D3 mortal wounds on a friendly unit to generate a point. When you couple this with the idea of taking cheap ten man units of Bloodreavers, you could really start pumping out the points as you may end up killing the unit which will also generate a point. We get two scenarios in the Battletome; one of which focuses on the Demons, and the other the Bloodbound. Both of them are fairly brutal and reward both players for playing as aggressively as you can. The demon one has no one taking battleshock the whole game, while the Bloodbound one is based off who can accrue the most Blood Tithe points. Just like all of the other new Battletomes we get rules for Path to Glory for the forces of Khorne in here. You have the option to build either a demon or a mortal force and the rewards you can earn fit in perfectly with the abilities and artifacts from the previous section. I really need to get in on a Path to Glory campaign. It seems like the perfect way to build up a new army and play games as you do. They have really gone to town on the Warscroll Battalions for this book. The Khorne Demons get 11 Battalions while the Bloodbound get 12! Pretty much all of the Demons ones are new except for one and they all look pretty awesome to me. Some of them require stuff like three Bloodthirsters, but others are more rounded requiring a hero, and a mix of units, which you can usually pick on your own. I like these kind of battalions the most because it really allows a lot of people who already have Khorne Demons to fit a more well rounded collection into a battalion. My friend's 1,000 point demon army already fits neatly into two different battalions. The buffs you get from these are all pretty good too, with some of them giving you an extra 2D6 move in various circumstances. For a combat army that can no longer take Sayl if you want the Allegiance Abilities, getting across the board in one piece is pretty crucial. The Bloodbound Warscroll Battalions features some older ones we have seen in the past book, but even these have been tweaked in some ways. For example, the battalion that use to just be three units of Wrathmongers is now different and also requires a Skullgrinder and a unit of Blood Warriors. Just like with the demons there are a few in here that are pretty well rounded in unit requirements and I think most existing Bloodbound players will be able to find a battalion they can use with their existing collection. Out of these battalions, the Demons and Bloodbound both have two that are for specific armies, just like the Stormhosts in the Stormcast book. One of the Bloodbound ones is the Goretide, Khul's personal army, and it gives some cools rules that buff your Mighty Lord of Khorne to represent Khull himself. As far as I can tell the unit Warscrolls themselves have stayed pretty much the same. There are no new units in the army, but two of the Bloodbound units have changed slightly and their points have changed as well. The Bloodreavers now have a 6+ save instead of having no save. This means they can no benefit from cover, Mystic Shield, and any other save buffing rules. They have also gone up to 70 points, so not a huge bump. The Khorgorath has also gone up in points, to 100, but its close combat attacks now do two damage per attack. Looking at the older version of the scroll I think that's a pretty good change since it reflects their monstrous nature more. All of these Warscrolls are presented in the new format, without the unit pictures so they can fit them all in, which is good since there are 33 individual Warscrolls. The whole book finishes up with the four pages of rules, and the pitched battle profiles at the end. There is so much packed into the Blades of Khorne, it really is a great addition to the Chaos line. Now Khorne players will be able to field their demons alongside their mortal units and I think the Blood Tithe system is perfect for them. I really hope this encourages more Khorne players to take a mono-Khorne force and drop Sayl from their lists at tournaments. There are enough buffs in here to more than make up for it. All of the background lore is fantastic as well, with tons of information to new Khorne players, and just enough new stuff for older Khorne players to be interesting as well. This book definitely brings the Khorne forces up to speed with the newer Battletomes and I wouldn't be surprised to see a bunch of Khorne players all of a sudden. It's powerful and feels perfectly fitting with the lore. Now your Khorne forces will feel even more like the bloodthirsty berserkers they are supposed to be as they charge headlong into the enemy, uncaring of their own fate since their death helps you out too. I definitely recommend this book to any Khorne players out there or Khorne curious Chaos players. It's also just a great addition to anyone whose interested in the AoS lore, especially at the new lower prices GW is selling their books at lately. Khorne cares not from whence the blood flows.